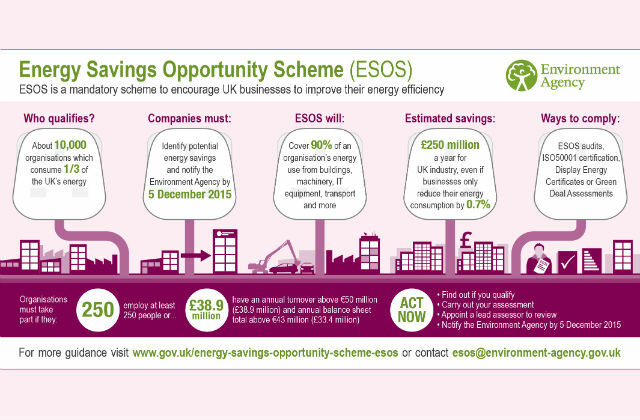 Is it true that nobody knows about the Energy Savings Opportunity Scheme (ESOS)? Should we worry about the number of organisations that are ESOS compliant? Can firms ignore the 5 December 2015 deadline? These are some of the questions I see cropping up in articles about ESOS, a scheme that encourages UK businesses to reduce their energy consumption, cutting carbon emissions and potentially saving themselves £250m each year. As I lead the team at the Environment Agency that administers ESOS I thought I should bust some of the myths around the scheme. We've sent out three separate letters to the directors of the 10,000 or so organisations that we believe are covered by the scheme, and continue to run a follow-up telephone and email campaign. This year I've been to over 30 events around the UK from Brighton to Edinburgh talking to organisations about what ESOS means for them. We’ve run workshops, set up a dedicated helpdesk and circulate a regular ESOS newsletter to around 3000 organisations. If you haven't heard about ESOS and its benefits you could read the press release we published back in September, or look at the ESOS webpages on GOV.UK, to find out more. Whilst familiarity with ESOS may not be high among the public or businesses not directly affected, a recent survey by DECC suggests that the majority (89%) of those who need to know are aware of it. ESOS is voluntary, isn't it? Actually it's mandatory. All large businesses in the UK that employ at least 250 people, or have an annual turnover above £38.9m and an annual balance sheet total above £33.4m, must take part in the scheme. Why is the number of ESOS compliant organisations small? Shouldn't you be worried? I'm regularly asked for updates on the number of firms that are ESOS compliant. It's true that progress was slow to begin with but the number has been steadily going up and now over 1,000 organisations have notified us that they have complied. Of course that number is still modest compared to the 10,000 or so organisations that qualify. However, we know that many more organisations are very close to completing their notification but have not yet filled in the form, which can only be done at the end of the process. Experience from other schemes tells us that around 50% of those that qualify only notify us in the last week or so before the deadline even when a scheme has been running for several years. So as this scheme is new we can expect it to be an even higher percentage for this first ESOS deadline. I've heard I can ignore the 5 December 2015 deadline, is that true? Some media reports suggest that we have ‘extended’ the ESOS deadline. This is incorrect. Legally we don't even have the power to do this. What we have said in our enforcement approach is that, using our discretion as a regulator, we would not normally expect to take enforcement action on organisations that submit an ESOS notification of compliance by 29 January 2016 providing they have told us by 5 December 2015 that they are going to be late. So whilst we encourage as many organisations as possible to be compliant by the deadline, even if organisations believe they cannot comply by 5 December 2015 they will still need to fill in an 'intent to comply' form, detailing why they cannot comply and what steps they have taken, by this date. I've just heard about ESOS and we can't comply by 29 January 2016 let alone 5 December 2015, so there's no point me bothering with ESOS is there? Yes there is. The sooner you communicate with us and get going with your ESOS compliance the better position you will be in when we have to consider enforcement action. We would encourage organisations to come into compliance as soon as they possibly can but we appreciate that you can’t perform miracles. So on your notification of ‘intent to comply’ please provide a realistic date for when you will be able to fully comply. Jo Scully is an Advisor at the Environment Agency and leads the team administering ESOS.